World policeman, the United States of America, has taken it upon itself to, once again, do what it thinks it is entitled to do, to think for every man and woman, and to make decisions on behalf of every living soul on the planet, in order to ensure control over the people it wants to control. The USA now wants to kill Osama Bin Laden's son. 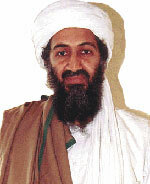 Hamza Bin Laden is Osama Bin Laden's son. He is said to have connections with al-Qaeda, the Islamist militant group. It is the US state department that has said this. According to the US state department, Hamza has, in the past, released audio and video messages, calling on followers to attack the US and its Western allies in revenge for his father's killing. And what's wrong with that? Any loving son worth his salt would do the very same thing. That's no reason to go having him killed as well, is it? Hamza "married the daughter of Mohammed Atta, who hijacked one of the four commercial aircraft used in the 2001 attacks, and crashed it into one of the World Trade Center towers in New York. Letters from Osama Bin Laden seized from his compound in Abbottabad where he was killed indicated that he had been grooming Hamza, who is thought to have been his favourite son, to replace him as leader of al-Qaeda, according to the state department." Well, that's that, then. If the US state department says it's so, it must be. Through Rewards for Justice, it has now offered "up to $10million" for information about Hamza, if anyone has seen him recently, or knows his whereabouts. "We do believe he's probably in the Afghan-Pakistan border [sic] and... he'll cross into Iran. But he could be anywhere though in south central Asia," rambled Assistant Secretary for Diplomatic Security Michael Evanoff, in a blundering media conference. Hamza is about thirty years old, and looks distinctly Arabic.